As Thanos, Josh Brolin has one of the sweetest gigs in the Marvel Cinematic Universe. His character is mostly computer-generated, he’s only ever had a handful of lines, he has a cool rocket chair in Guardians Of The Galaxy, and he still gets to be the biggest villain in the whole universe. However, Avengers: Infinity War will make him get out of that rocket chair and actually do something for once, and it sounds like Brolin is really excited about the prospect of finally getting a chance to murder some superheroes. Speaking with Moviefone (via IGN), Brolin said that he recently “sat at a table” and “listened to the [Infinity War] story from beginning to end,” which he seemed to be pretty happy with. He said that actors sometimes have to say something is “a great movie” or “a great experience” even though they don’t really mean it, but Infinity War “is the opposite.” He says the story is basically about Thanos “against everybody” and is “really fun” overall, adding that he was “blown away” by how “brilliant” it all was. He even claims that he “had goose pimples” for most of the time he was hearing the story, and he’s “pretty amazed” that he gets to be a part of it. No plot details about Infinity War (which is reportedly just a working title) have been released, but it will most likely feature some of the same elements as Jim Starlin and George Pérez’s The Infinity Gauntlet comic. 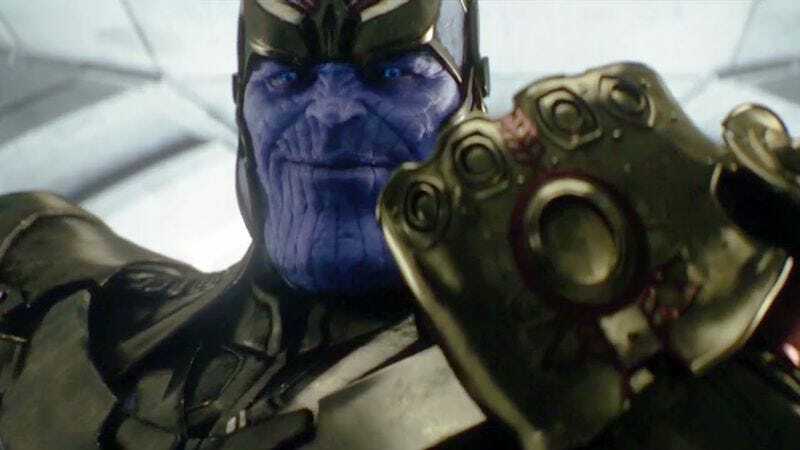 That story involved Thanos essentially becoming the supreme being of the entire universe, so it’s not especially surprising that the guy playing Thanos would be into that.